DollHead Corporation, where true freedom exists for all lifeforms. Welcome to DollHead Corporation. 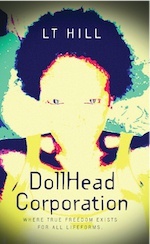 Founded by Loretta Wizelhause, DollHead offers whatever you desire most. Whether you need resolution of a standard life issue, crave an intergalactic meeting, or want an experience with the paranormal, the staff will do all that is necessary to assist you. It matters not if you be human, alien, or spirit, Ms. Wizelhause has made sure that her corporation is able to satisfy your need. So, enjoy the tour of DollHead Corporation. Should you become a client, you'll find that we always do our best to uphold all agreements as long as you uphold yours. However, should there be a breach on your behalf, please know that we collect immediately. Whether it be life years or your soul, DollHead Corporation will own it completely to do with as Ms. Wizelhause decides. To show you that we are a corporation you can trust, we offer client testimonials for you to peruse at your leisure. Again, welcome to DollHead Corporation, our goal is to make you happy. LT HILL is an avid lover of anime, science-fiction, and paranormal studies. This is her second novel, but first in the realm of science-fiction/paranormal. She likes to spend her free time focusing on strengthening her spiritual body through meditation and reading.